Property Size 2,350 sq. ft. 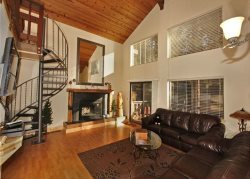 This lovely Highland Woods home is ready for your family to stay for a few days and enjoy the Tahoe area! Its reversed layout with upstairs living makes for a great set-up with a conversation friendly, and fully equipped kitchen with bar, media area in the living room with flat screen TV, along with a 1/2 bath, and huge master bedroom with king and private bath with large tub and separate shower. Downstairs there are two additional bedrooms each with a queen bed, plus a den (great for the kids to hang out) with cable TV, games and a futon for extra sleeping space. The upstairs living room also has a sofa sleeper if needed. All the furnishings have a nice "Tahoe Flair" with pine log beds, tables and more. There is an upper deck off the living room to enjoy an outside area, and downstairs there is a deck with private hot tub in the fenced back yard. This home is located only a little over a mile to the lake, and just 3.5 miles to Heavenly or the casino area. If you bring bikes (or rent them while in town) the bike trail goes through this neighborhood so it's easy to hop on the network and go either East or West along the Tahoe shores (great for running or walking as well). You can walk to some great local restaurants from here as well including Samurai Sushi, Red Hut Cafe, Scusa's Italian, and the Cold Water Brewery. We ask that you please do not smoke inside and there are not pets allowed.